This is Allen’s third book (and I’ve read the other two — The Sugar Queen and Garden Spells), and it’s just as enchanting as her previous works. While it’s not what I would snobbishly deem “serious” literature, it’s extremely captivating. 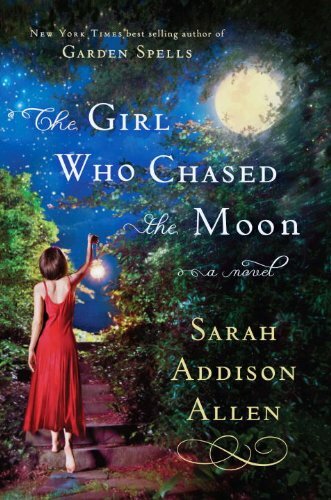 The Girl Who Chased the Moon is one of those books you just can’t put down. Of course, it’s also got that special something (for me: magic!) that fascinates and excites your creative faculties. It’s full of what Win Coffey, one of the central love-interests, calls “strange and wondrous things.”One odd thing about this book is that it’s one of those stories that has two main characters. In this case, the story opens with Emily Benedict — a 17-year-old girl who has just moved to her mother’s hometown following said mother’s tragic and unexpected death — which instantly put it into my mind that this story was Emily’s. Well, about 50% of it is Emily’s story (which reminds me vaguely of a healthier version of Bella and Edward’s story in Twilight), but the other 50% belongs to Julia Winterson — a middle-aged woman who has returned to her hometown with every intention of leaving it again. While Emily’s story seemed to me, at first, to be the main story this novel was trying to tell, Julia’s was far more interesting to me. Maybe it’s because I’m not in high school anymore that I found Emily’s tale somewhat less interesting than Julia’s, or maybe there’s another reason…but either way, I identified more closely with Julia (and I don’t think it had anything to do with the fact that we’re both in love with blond-haired blue-eyed men).Personal issues aside, I think Allen’s story was a really fun, quick read, but I will admit that I also found it to be somewhat less complex than I was hoping for. It’s a fairly simple, straightforward love story involving forbidden love, broken hearts, long-kept secrets, and ultimately happily-ever-after conclusions…but it grabbed my interest and held it from cover to cover. If you need a break from reality, this is definitely a book to pick up!